Here’s a scenario that I hear all the time. Does this sound familiar? You decide to dedicate an hour to family history research. You sit down at the computer and make a goal to find names for the temple. You open FamilySearch and find an ancestral couple that you researched several years ago. You do some descendancy research and pull up their Puzzilla descendancy tree. You look at the FamilySearch profiles of several 3rd cousins. It looks like they need additional research. Some have sources, some don’t. When the hour is up, you have not reserved any temple work. Instead, you have a many questions. Who is the spouse of Lillie Frazier? Did she have any children? When did she die? Lillie’s brother Ellis Frazier has a wife and one child. Did Ellis have any additional children? There are no sources attached to Ellis. What sources would he appear on? You wish you had more time to spend, but are interrupted by the next thing on your calendar. Because you didn’t accomplish your goal of reserving temple yet, you feel frustrated. But you shouldn’t! Here’s why. Finding names for the temple takes more than one hour. You simply started the process. And you even started on the right foot by doing descendancy research. So, what went wrong in this scenario? You forgot to keep track of what you did. You didn’t note in a research log who you looked at and your questions about them. The next time you sit down to research, you can’t remember where you left off. So today, I’m going to share with you a wonderful, convenient tool that can solve this problem for you. It’s a simple research log that you can use while doing descendancy research! In Puzzilla! You just click “log” while looking at relative’s profile in Puzzilla, and a new window opens with your research log, and the person you just clicked on is magically added for you. Then you can instantly type notes or add a status. There are 5 different status flag colors and you decide what they mean. Puzzilla premium costs $39.95 per year after a 30 day free trial. By the way, I am not an affiliate of Puzzilla, I just love it. Here are all the details of what you get in a premium Puzzilla subscription: Premium Puzzilla FAQs. Here is an article about how to use the Puzzilla Log. You noted that you should search for a marriage record and grave record next. You remember that she has no children listed in FamilySearch and that there were no hints. Your wrote down your objective to find her spouse and children. For the next hour, you spend time searching for information about Lillie B. Frazier. You click on Lillie’s name in the log and a box opens with several choices. You click the button to view her profile in FamilySearch Family Tree, search for information at findmypast.com, and search Ancestry.com. Three new tabs open in your internet browser. You see in FamilySearch that she already has one source – a marriage record showing a spouse of Cecil. You decide to search for census records to see if they had children. You find Lille and Cecil living in Texas with their first daughter in 1930! Hooray. You can now search for the daughter’s death date and contact living relatives there to see if they will give you permission to do her temple work. 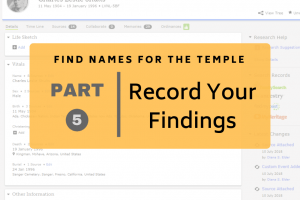 Take the next step in your process to find names for the temple, and try the Puzzilla log! 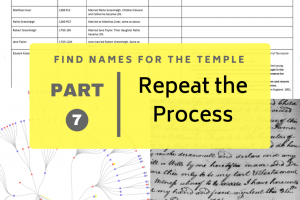 Would you like to learn more about my process for finding names for the temple? Check out my blog series here: Find Names for the Temple. 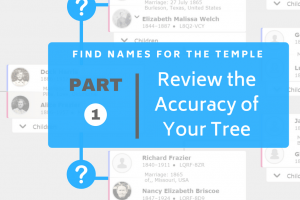 Need extra help getting started with the process of finding names? Contact me for a free consultation: nicole@familylocket.com. I love helping people get started.